The latest black sport watch Motors MS3 2016 is officially announced today and available for purchase. Swiss watch brand Wryst is offering you the opportunity to pre-order this exclusive limited edition watch scheduled to be available in stock first quarter 2016. Only 99 will ever be produced. 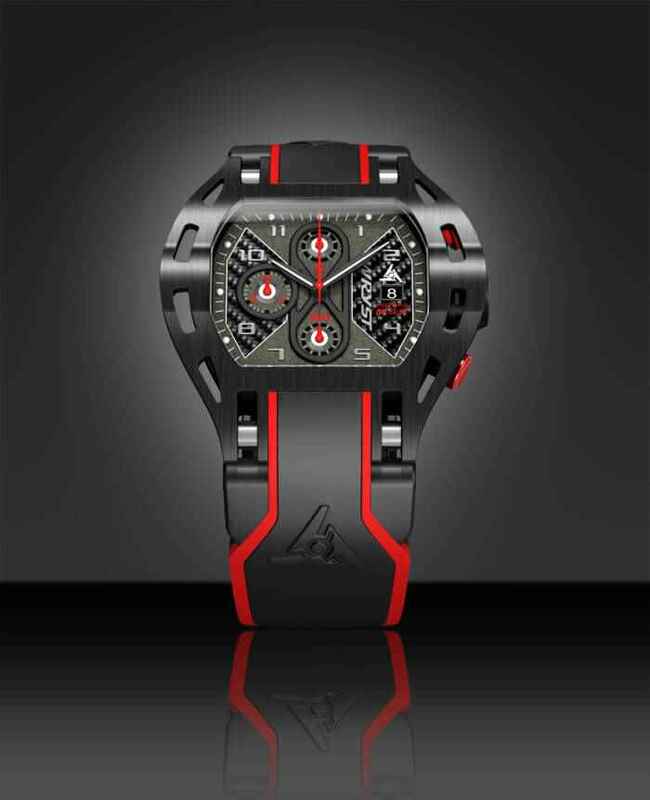 Following the overwhelming success of the Motors collections, Swiss watch designer and brand owner Jacques Fournier has created a new Motors timepiece more than ever influenced by the Motorsport industry with Carbon Fiber material on the dial. Carbon fiber is commonly used in the motorsport industry for racing sports cars monocoque and many other parts. Stronger and more resistant than steel, carbon fiber composite also offer an excellent strength-to-weight ratio. This material is strong and durable but it also looks great! The chronograph functions of the Swiss Ronda 3834D are started, stopped and reset with two polished red anodized pushers. Like all other black sport watches from the brand, this reference is protected with Diamond-Like Carbon coating which offers highly competitive longevity of your black Wryst timepiece. This particular Motors MS3 also has a polished screw-in black DLC crown which is new for the 2016 collections. Like the previous MS1 reference now sold-out, the MS3 dresses with a comfortable and futuristic two color silicone strap in black and red, and it will be possible to acquire this timepiece in the future with a black and grey genuine leather strap. Contact us for more information and if you require to reserve your own serial number. For over four years, the Swiss brand proves to be at the forefront of atypical sport watch design with unprecedented style. 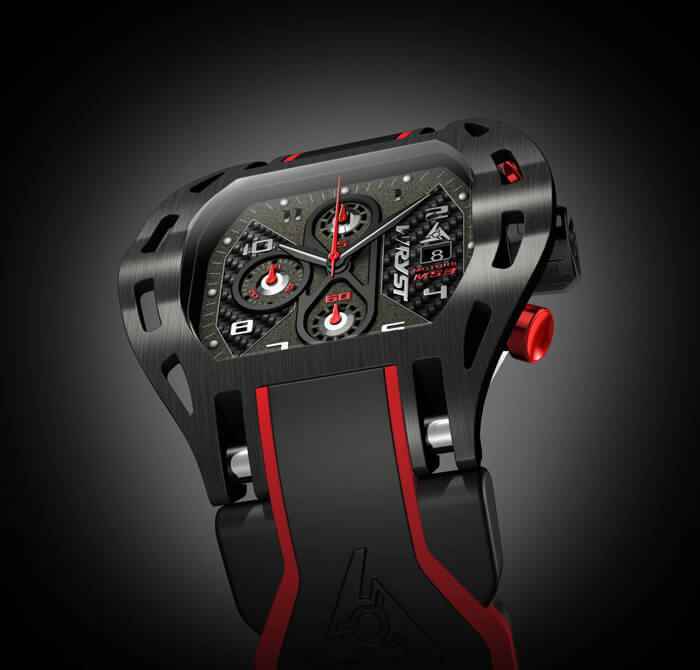 Wryst offers ultra-competitive value for money on an exclusive, non-retailed basis and the timepieces are all produced in limited editions and only available for purchase from the manufacturer. 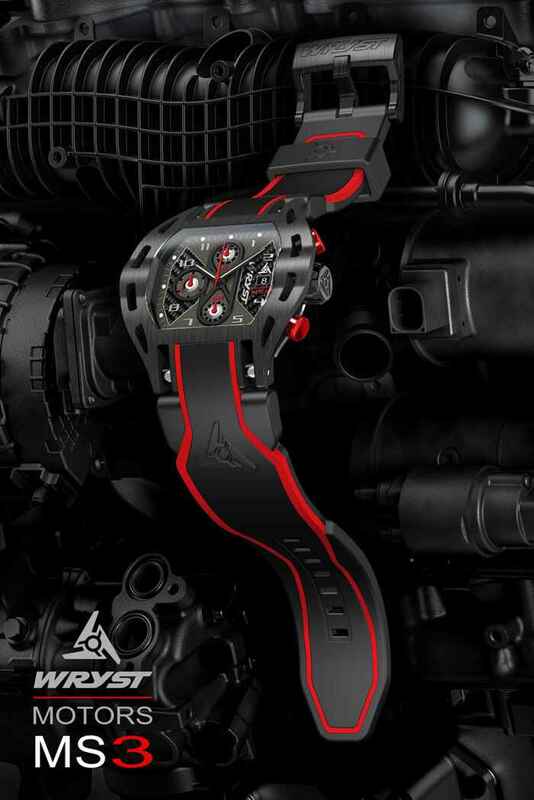 Pre-order today the new 2016 Carbon Fiber Black Sport Watch Wryst Motors MS3. Get your sport watch in time for Christmas! Stunning watch..., absolutely stunning! Please do you have the exact date they will be in stock? Thank you.